﻿ InterContinental San Francisco, San Francisco (CA) | FROM $169 - SAVE ON AGODA! "Very spacious, comfortable and clean." "when I walked in to the Intercontinental Hotel I was greeted with a warm welcome from the front desk staff: Tyerra Jackson, Lauren McGrath, & Snow!" "This hotel is in a very centrally located area." "Pleasant stay, spacious room, and friendly staff"
Looking over San Francisco's SoMa area, moments from top city centre sites including Union Square, this hotel provides modern in-room amenities. Spacious accommodations at the InterContinental San Francisco are furnished with all the latest technologies, including flat-screen TVs and iPod clock radios. Guests will also appreciate in-room minibars and coffeemakers. While staying at the San Francisco InterContinental, guests can enjoy 24-hour fitness facilities, complete with an indoor lap pool. A gift shop, Luce restaurant and Bar 888 are also located on-site. 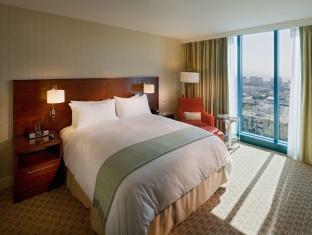 The completely non-smoking InterContinental San Francisco is placed near the Moscone Convention Center and Chinatown. The nearby Powell Street Cable Car also offers instant access to other popular areas of the city, including Fisherman's Wharf. "The room was OK with good bay view." Breakfast is only included for guests who book breakfast rates. Breakfast rates include breakfast for 2 guests daily. Guests are required to show a photo identification and credit card upon check-in. Please note that all Special Requests are subject to availability and additional charges may apply. It was very comfortable and pleasant. Loved the smiles and kindness of the staff. Parking was pretty expensive but we didn't have any other choices. Didnt have chance to eat or drink at the hotel due to busy schedules and yummy food in the chinese quarter! The location was also not too bad! Unfortunately 2 out of our travel party were sick whilst in SF. The hotel staff were extremely helpful and found us another room to quarantine them. They also help us find and book into the doctor. The hotel was in a great location and was very comfortable. Nice stay, but it felt like something was missing compared to other Intercontinentals that we have stayed at. We then found out there is another Intercon in San Fran which is likely the one to stay at. Pleasant stay nonetheless. I would say it exceeded our expectations. I have stayed in several Intercontinental Hotels in Asia Pacific, and they are all quite nice hotels. With this one, we were not sure at the beginning since we got a good deal on the room rate so thought it is not the same as those in AP. It turned out to be a very comfortable stay. Nice room and within walking distace to many attractions in the SF. Usually stay at another hotel in San Francisco downtown, but they are charging very high rate during the period I would like to stay. So decided to try out Intercontinental, I think I will stay here again in the future because the location is really great, it was an easy access to all shops and restaurants in downtown, it is also next to a park and the convention center, really great location. Close to the action and great restaurant. Super high valet parking charges (use carpark behind hotel). High internet charges. One block away from the shopping and about a 5 - 10 minute walk to Union Square. 5 Star staff that are highly trained, courteous and take pride in their work and company. The rooms were comfortable and very clean. Great city view and the glass wall that was the window really added to the ambiance. Very friendly and helpful staff! A lovely concierge gave us her recommended walking tour of the city and it was fantastic, definitely the road less travelled. The hotel also offered complimentary umbrella usage, which was great for a wet city. The hotel rooms are clean and reasonably spacious for the price range. A good 24 hour gym and pool. Great location close to the trams and shopping. The only negative was that valet packing was super pricy at $60 per day. I would recommend finding parking at nearby parking garages for almost half that fee. the location is quite central and i like the room. it is reasonably spacious and kept clean. very impressed by, the conciergem who assisted with a few restaurant and tour bookings, even got me a booking at la folie restaurant which when i tried previously was fully booked. We loved the room! Very spacious, comfortable and clean. Beautiful velvet sofa was very nice but either drab or sun damaged. Bathroom is very large, big tub, separate spacious shower (low water pressure.) View’s from the 32nd floor were great! Staff friendly and helpful!!! Room service (dessert) was tasty. We had the bread pudding (just ok) and chocolate mousse tort (very decadent.) We will definitely stay here again if we have the opportunity! Firstly: When I checked in the staff let the ambassador cut the queue. Why my queue is a normal queue but I should wait for the ambassador to check in before me? There is an ambassador queue but the staff was out for something. Why should I pay for their absence? Secondly: I paid Agoda 3 months ago when I booked the hotel in order to get the good price. But when I checked in they request me to pay. I said I have already paid Long time ago and I also present my booking information, the staff asked me to proof my payment, I said my internet banking can only available for 3 months transaction and now exceed 3 months already. But my Agoda did indicate I have already paid the hotel. They hotel asked me to pay first and if I paid before they will refund me. I re-present my confirmation of payment from Agoda, then hotel staff said: oh Agoda did not pay our hotel. Maybe you just pay $300 normal deposit first, we should wait until Monday to check with Agoda. Thirdly: race discrimination. I was extremely irritated with Priceline.com for their lack of effort to fix my reservation that they made a mistake on! But when I walked in to the Intercontinental Hotel I was greeted with a warm welcome from the front desk staff: Tyerra Jackson, Lauren McGrath, & Snow! Their presence brought my attitude from negative to positive real quick! I will always recommend this hotel to everyone for a amazing stay! Thank you for being the most amazing late night staff in the city! This hotel is in a very centrally located area. All over San Francisco and will find A lot of homeless people. But don't let that bother you most of them are homeless and keep to themselves. This hotel is a beautiful clean well-kept hotel when excellent mannered staff and beautiful facilities as well as an indoor pool spa and Gym. 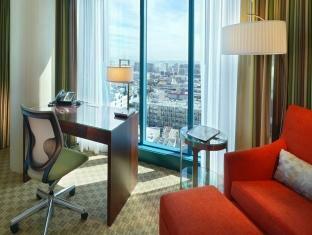 We had a beautiful club room on the 31st floor with access to the intercontinental club. Which gives you a fabulous breakfast afternoon snacks and beverages evening as well as beers and alcoholic beverages cappuccino espresso etc. food which would be enough to suffice your appetite for dinner. It is well worth the price to take a clubroom if you are going to utilized the food and beverages in the Intercontinental club. Nothing short of exceptional. Clean, modern and fuss free experience. Staff were also very helpful and provided good recommendations on sightseeing. Will definitely return. Location is near to Powell Station, 5 min walk, and next to the convention centre. Quite safe to walk about alone. I stayed in a room that was supposed to normally be $1600 a night, it should have been $200, no king size bed, a tiny room and substandard bathroom. Very disappointed and then they tried to charge me for the internet even though it was supposed to be part of the deal..not impressed. A pleasant hotel to stay as it lives up to her name. the room is spacious, clean, luxurious and comfortable. a welcoming hotel located to many attractions , shopping, food and all. Staff are courteous and helpful, the hotel exudes warmth. The nice view and pleasant atmosphere are part of the deal. 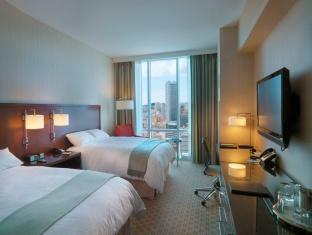 Overall, a nice hotel to stay whether for holiday makers or business travellers.